Iago Galdston, of Truro, in the County of Barnstable, brings this proceeding under the provisions of G. L. (Ter. Ed.) c. 185, Sec. 1, as amended, to register and confirm his title to a parcel of land (hereinafter "locus") situated on the westerly side of Old County Road, in the said Town of Truro. The premises are shown on Land Court Plan No. 35478[A] filed with the petition. An answer and appearance were filed on behalf of Sabina G. Teichman and Robert S. and Ethel H. Levy claiming an interest in the locus as described in the petition. These parties later agreed to consent to the entry of a registration decree in favor of the petitioner, subject to certain stipulations filed with the pleadings herein. An additional answer was filed by Stanley G. Chamberlain claiming title to a portion of the locus sought to be registered, located in the northeasterly section thereof. Thus, the present controversy involves one respondent, Mr. Chamberlain, who wishes to resolve a single issue, namely the location of the northeasterly line of the locus as claimed by the petitioner. A stenographer was sworn and testimony was taken at the trial held on December 4 and 5, 1973, January 30, 1974, and July 31, 1974. A view of the locus was taken by the Court on July 15, 1974 with counsel for petitioner and respondent being present. Since the trial, conferences have been held between attorneys and clients and attorneys and the Court, seeking to resolve the differences, but to no avail. At the trial one chalk and twenty-eight exhibits were introduced into evidence and are incorporated herein for the purpose of any appeal. All references to book and page numbers are to documents recorded at Barnstable County Registry of Deeds, unless otherwise noted. The Court heard testimony from petitioner's witnesses, Iago Galdston, William Swift (the petitioner's Land Court Examiner), Winfield Schofield (petitioner's surveyor) and Margaret Frank; and from respondent's witnesses Stanley G. Chamberlain and Albert Henry Nickerson (respondent's surveyor). To facilitate the understanding of the problems involved in this complex case, the Court has prepared a sketch which incorporates the salient features of the petitioner's and respondent's plans, as well as the filed plan in Land Court Registration Cases Nos. 28240 and 23807 and other plans as herein noted, and has attached the same as Appendix A [Note 1]. The title which petitioner seeks to register is derived from three separate chains. That portion of the title westerly of the points marked A-B on the sketch plan comes from two different chains and since no questions have been raised as to the sufficiency of the title thereof, no further consideration is given herein. A question does, however, arise from the third chain involving title to that portion of the locus included in the area marked A-B-C and D on the sketch plan and the Court addresses itself to this. The Land Court examiner filed a title report dated March 27, 1969, stating that in his opinion the petitioner had good title for registration to the locus as shown on the filed plan. Subsequent thereto and after a change in petitioner's attorney, the Land Court examiner filed a supplemental report in which the same opinion was set forth. This supplemental report corrected the original report and showed that the back title to that portion of the premises marked A-B-C-D on the sketch plan stemmed from the heirs of John Mayo, Sr. rather than from the Estate of Rebecca Paine as the examiner had originally believed and reported. This supplemental examination agreed with the title examined in the Land Court Registration Case No. 23807, of which case this Court takes judicial notice. ..."A certain piece of Land with the buildings thereon, situated in said Truro, on the South side of Pamet River and was formerly the Homestead of John Mayo Senior, late of Truro deceased. It is bounded and described as follows: Beginning at the Southeast corner thereof at a stake & stone by the Proprietors Road and the range of Nehemiah Mayo's Land: thence Northeasterly by said Nehemiah's Land thirty two rods to the Land of James H. Lee: thence Northwesterly by said James land twenty two rods to the School House Lot: thence Westerly by said School House Lot twenty and one half rods to the land of Samuel B. Rich: thence Southerly by said Rich' land and the Land of Richard L. Mayo, thirty eight rods to the Proprietors Road: thence Easterly by said Road to the first mentioned bound twenty one and one half rods." This is shown on the sketch plan generally as the parcel east of the line A-B-C, with the location of the northerly line from D westerly to the line A-B-C, being in question. It should be noted that the second call in the above deed recites that it runs "by said James (H. Lee) land twenty two rods..." Lee got his land by deed from the heirs of John Mayo (presumably Senior) dated November 26, 1862 and recorded on September 15, 1871 (Exhibit 20). This suggests at the very least that the description in the Mayo to Grove deed (Exhibit 15) dated 1860 was changed some time before it was recorded in 1874 to reflect subsequent ownership by Lee of the adjoining parcel therein described. The third call above recites that the line ran "Westerly by said School House Lot twenty and one half rods...", which roddage is equal to 338.25 feet. This is not the first mention of this School House Lot, as will be seen hereafter. "Commencing at a point at the junction of a town road and the old County road near the land of John DeLuze, thence running in a northerly direction by the land of said DeLuze to the land of Burns and continuing in a northerly direction by land of said Burns to a stake by the land of the grantee and Woodbury W. Smith, the entire length of said line being 601 feet more or less from beginning to the stake, thence running in an easterly direction by the land of said Smith 334 feetmore or less to the old County Road, thence turning and running in a southwesterly direction by the Old County Road 682 feet more or less to the point of beginning. The area of the same being 2 acres or more." Petitioner's record title rests upon the above deed and it remains to locate this parcel as so described on the ground. 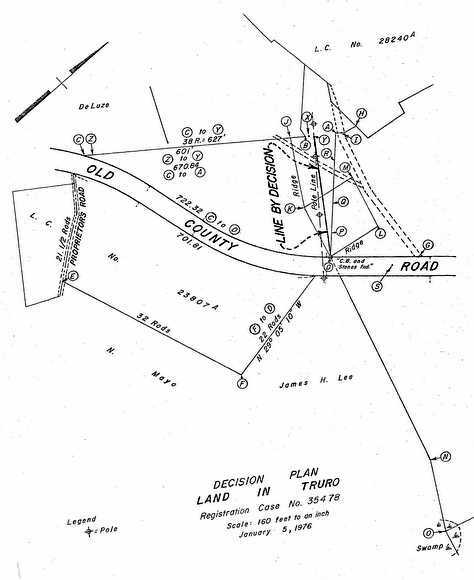 No question was raised by the parties herein that the starting point in the description in Exhibit 2 is the junction of the town road and Old County Road as shown on petitioner's filed plan. This starting point is shown as point C on the sketch plan. It should be noted here, however, that the "Spk. Set" on the filed plan, which is point C on the sketch plan, is 26.93 feet south of the "Stk. fnd." on the filed plan, which is point Z on the sketch plan. This will have a bearing as will be seen later herein. The easterly line in Exhibit 2 is recited as being 682 feet, more or less. In the 1860 deed, Book 121, page 33 (Exhibit 15), there is no corresponding boundary, as this 1860 deed included a parcel to the east of Old County Road previously registered in Land Court Registration Case No. 23807. The filed plan shows this easterly line (C to D on sketch) measured along the westerly line of Old County Road to be 722.32 feet, some 40.32 feet more than called for in Exhibit 2. The decree plan entered in Land Court Registration Case No. 23807 registering title to the easterly portion in Book 121, page 33 (Exhibit 15) shows the easterly line of Old County Road to be 701.81 feet. Since the easterly line of this parcel crosses Old County Road from south to north on a course of N 29 05º 10" W, it intersects the westerly line of Old County Road at the point marked "C.B. and Stones fnd." as shown on the filed plan and marked "point D" on the sketch plan. This point is 11.83 feet northerly of a concrete bound as shown on the filed plan. The respondent's plan (Exhibit 23) drawn by Nickerson & Berger in July, 1961 shows point D along the southerly line of land claimed by respondent, marked as "C.B. SET". This point is also the southernmost point of a line marked "Ridge", and the southeasterly corner of an area marked "Roman Catholic Bishop of Fall River" on said plan. Thus, there was substantial agreement, until late in the trial when petitioner's surveyor Mr. Schofield suggested otherwise, that point D on the sketch plan marked the northeasterly point of petitioner's land, as claimed by him and shown on his filed plan and as shown by respondent. Therefore, even though this point is some 40.32 feet farther north than the distance called for from C to D in Exhibit 2, the Court finds that this is the northeasterly bound of petitioner's land, since the respondent's plan designates this as the boundary and the petitioner's filed plan does likewise and since the Land Court in effect did so also in Land Court Registration Case No. 23807. With the points C and D fixed on the sketch plan, the difficulty then remains to fix the third point. "Beginning at the Northeast corner thereof at a stake & stone, thence Southerly in the range of the land formerly belonging to the heirs of Tho. Mayo to a stake & stone in Nehemiah Mayo's range, thence Westerly in said N. Mayo's range to a stake and stone in Samuel B. Rich's range, thence Northerly in said Samuel B. Rich's & the heirs of Ezekiel Atwood's range to a stake & stone in Nath. Hopkins. thence Easterly in the range of said N. Hopkins to the first mentioned bound...."
thence Ely in the line of sd Richard R. Hopkins & Nathaniel Hopkins land to the first mentioned bound with the dwelling house and out buildings thereon." As may be seen in this deed dated in 1854, the "School House Lot" was mentioned and presumedly then in existence. Paine & Co. then conveyed this parcel to Hannah C. Brown by a deed with a similar description dated August 28, 1858, recorded in Book 67, page 278, a certified copy of which deed was supplied at the request of the Court and by the Land Court Examiner. "A certain parcel of land on the South side of Pamet River in said Truro at the neck, so called, together with the building thereon known as the Neck School House and is bounded as follows viz. Beginning at the North West corner of said land thence running easterly in range of land of Obediah S. Brown nine rods, thence Southerly nine rods, thence Westerly nine rods, thence Northerly nine rods, in range of land of heirs of John Mayo to the bound first mentioned containing eighty one rods and is the same lot conveyed to the town of Truro by heirs of John Mayo by deed September 15, 1862 to which reference is had, and by said town of Truro to me by deed dated March 26, 1883 to which reference is had." The parcel is described as 9 rods on each side which is different from the 20 1/2 rod measurement as set forth in Exhibit 15, which describes the Sly line of the School House Lot. It is bounded by the land of Obediah S. Brown to the north, by land of the heirs of John Mayo, Sr. to the west, but makes no mention of who the owners are of the land bounding this parcel to the south and east. Further, the deed states that it is the same lot conveyed to the Town of Truro by the heirs of John Mayo, Sr. by deed dated September 15, 1862, and subsequently by deed from the Town of Truro to George S. Hamilton date March 26, 1883. There is no record of these two deeds so that presumably they were never recorded. This explains what transpired, as we know that in 1860 the heirs of John Mayo, Sr. conveyed to James Grove a parcel bounded on the School House Lot there measuring 20 1/2 rods (Exhibit 15). It mentions the Brown land as being to the north. The land between the westerly line of the 9 rod parcel marked M-K and the land of Rich, now of Galdston, marked I-A-B-J on the sketch plan, is said to be of Mayo. There is no record of Mayo ever conveying out any such parcel as this, to Grove, Perry, Galdston or any other grantee except as set forth in Exhibit 21 wherein it was supposed to have been conveyed to the Town. This is the only explanation offered, and the Court finds that the Mayo heirs conveyed this strip of land at least 9 rods square and perhaps 9 rods north and south by 20 1/2 rods east and west to the Town of Truro by this unrecorded deed referred to in Exhibit 21 and that the Town, in turn, conveyed this same parcel to Hamilton by a deed dated March 26, 1883, again not recorded. Thereafter, the history of this parcel, variously referred to as the "School House Lot", "Nine Rod Parcel", or "Church Lot" is almost clear, for there was a deed from Obediah Brown to the Catholic Congregation of Truro, dated July 23, 1894, recorded in Book 271, page 207 (Exhibit 26); and finally a deed from the Roman Catholic Bishop of Fall River to respondent (and his wife, now deceased) dated October 21, 1965, and recorded in Book 1317, page 480. This last deed contained a slightly different description, in that it recited that the lot was bounded to the south by land of James Grove as well as being bounded by land of Grove to the west, as is shown in the deed from Hamilton to Brown (Exhibit 21). "A certain lot of land known as the Neck School house lot the same being fully described in deed from George S. Hamilton to Obediah S. Brown dated June 20, 1885, Deed herewith surrendered." "Certain parcels of land conveyed by Jesse Souza to Woodbury W. Smith by deed dated August 28, 1916 and recorded Barnstable County Registry of Deeds Book 345 Page 592, namely..."
and then proceeds to list parcels numbered "First", "Second", "Fourth", "Fifth", "Seventh", "Eighth", "Ninth", "Tenth", "Eleventh", and "Twelfth". Parcel Sixth, the School House Lot, for some unexplained reason is omitted and there is no evidence to show that Smith ever conveyed it out during the time it was supposedly held by him. Respondent's engineer and surveyor, Mr. Nickerson, located this 9 rod parcel on his plan (Exhibit 23) and Mr. Schofield, in turn, noted the parcel so located on the petitioner's filed plan. On the sketch plan it is identified as the area bounded by the points D-K-M-L. The southerly line of this lot was drawn almost as an extension of the southerly line of the respondent's land lying to the east, drawn from a stake marking the end of a fence found by Mr. Nickerson on his survey and replaced by a concrete bound by him, shown as point N on the sketch plan. From this point the line was drawn to the northeast corner of the parcel claimed by petitioner, shown as point D on the sketch plan. It was then extended westerly on a varied but very similar course for 9 rods to a point at the end of a "Ridge" as shown on respondent's plan. This is also pointed out on petitioner's plan, and on the sketch plan it is shown as point K. From point K, Mr. Nickerson changed the course to the northwest and ran the line to point J along this ridge. From point D the Nickerson plan likewise shows a ridge running north and south on the line from D to L on the sketch plan. The view disclosed slight rises in the ground but to the uninitiated the course of these "ridges" is hardly apparent. It should be noted that the "ridge" from point J to K corresponds with the area pointed as a "ridge" on the Whitney and Bassett Plan in Land Court Registration Case No. 28240. Nickerson testified that he had interviewed one Howard "Pop" Snow, a local handyman, who pointed out the former location of the schoolhouse as being approximately in the center of the lot marked "Roman Catholic Bishop of Fall River" on the Nickerson plan. There was testimony that "Pop" Snow had aided his own father in removing this building to another location in the Town many years before. This conversation with Snow took place about the time Mr. Nickerson's plan was drawn, in 1961. There was also evidence that respondent held talks with Mr. Snow when the latter tried to sell this land to him, at least one conversation being in 1961 and some thereafter in 1965. Perhaps this would be a good place to further explain that "Pop" Snow was the person who assisted Galdston in showing the electric company where to place its line into the Galdston house, when electricity was installed about 1931. Galdston testified that he had wanted to be sure that the line was installed on his land. This line is shown on both petitioner's and respondent's plan and on the sketch plan. The view showed that it consisted of an overhead line with two poles in the contested area with a third pole to the east of Dr. Galdston's house in the uncontested area. Dr. Galdston had this line installed at his own expense and later allowed Teichman to the north to tie into it, but only by means of underground wires. He has used this utility line continually ever since its installation, its location being below the hill which rises sharply to the south of the pole line. Before leaving the testimony of Mr. Nickerson it should be pointed out that he found a bound in a swamp to the extreme east, marked O on the sketch plan, and a fence line running west therefrom toward a point N. This point is found likewise on the 1848 plan entitled "Cape Code From Highland to Nauset Light" (Exhibit 27). Petitioner's evidence of the northerly boundary line as claimed by him on the filed plan, line A-D on the sketch plan, must be considered in some detail. At the time of the survey the petitioner was represented by one Mr. Snow who was the Commissioner appointed (by the Probate Court) to partition the land of Woodbury W. Smith and had signed the deed of the premises conveyed to respondent Chamberlain (Exhibit 22). Mr. Schofield testified that he had established the north line by amassing all the information available to him and going out to the ground. At a point about 146 feet (approximately 9 rods) west of the N. E. point of petitioner's claim, which is point D on the sketch plan, he found a red fieldstone located in an area where stones of any kind are uncommon. He also observed foreign type vegetation in the area which led him to believe that different uses had been made of the land east of this stone than was made to the west thereof. Together with Attorney Snow and Dr. Galdston's daughter and son-in-law, Mr. and Mr. Murray Frank, Mr. Schofield met with Mr. Howard "Pop" Snow on the premises at 11:00 A.M. on July 22, 1967. Along the northerly line shown on petitioner's filed plan, being line A-D on the sketch plan, a white stone was found some 67' northwesterly of point D. This stone is found to be a trifle to the north of the line as set by Mr. Schofield at the edge of what he has designated on the filed plan as a line of bushes. The red stone found 146 feet northwesterly of the road, and marked Q on the sketch plan, was shown to Mr. Snow. "Pop" Snow executed an affidavit on August 4, 1967 (Exhibit 17) stating that he had gone to the land on July 22, 1967, then being 85 years old. He stated that this line A-D was the northerly line of the Perry parcel, claiming there had previously been a fence line now marked by cherry trees. The affidavit itself however places the School House Lot uncertainly, if at all, and the weight to be given to it is shaken by contrary remarks made to Mr. Chamberlain and to Mr. Nickerson when "Pop" Snow was a considerably younger man. Mr. Snow has died since the execution of the above mentioned affidavit. By placing this northerly line from D to point A on the sketch plan, Mr. Schofield held true to the distance called for in the deed from Perry to Galdston, namely 334 feet more or less, as it measures some 332.94 feet. In addition it passes through a point designated on the filed plan as "Stk and Stones fnd. ", and marked R on the sketch plan, a point of obviously some significance, although of what it is uncertain. This point does not appear on respondent's filed plan but does appear on the Whitney and Bassett Plan in Land Court Registration Case No. 28240. It was evidently an extension to the south of the the easterly line originally sought to be registered in this case. Mr. Schofield ran the line A to D through this point R placing it slightly to the south of points Q and P. If the westerly point of the northerly line of Perry is placed at point A on the sketch plan as called for by Mr. Schofield, it would mean that the westerly line of the parcel from A to point C would be 670.84 feet in length, a rather marked difference from the 601 feet set forth in the deed from Perry to Galdston (Exhibit 2). The Schofield testimony as to his placing of the northerly line leans heavily on the Snow affidavit, the stake with stones marked point R, and the red fieldstone at 146 feet and the stone at 67' west of the northeasterly boundary of petitioner's land as agreed upon by him and Nickerson and shown as point D on the sketch plan. The view showed bushes about as placed by Mr. Schofield and that the area to the north of his proposed line near Old County Road is in a marked hollow. In addition, Mr. Schofield testified at length as to the layout for highway purposes in 1867, shown as Sheet S-12 on the supplement to the abstract. By computing and plotting the distance as laid out by them on a chart (Exhibit 16), the land of Obediah S. Brown and James Grove are shown to abut. The point where they join is shown in green on the Nickerson Plan (Exhibit 23) and is marked point S on the sketch plan. It is also noteworthy that point S is about 9 rods northeasterly of point D on the sketch plan. This would seem to indicate that the Brown parcel originally was to the north of where it has been placed on the filed plan and on the Nickerson plan. The County layout of 1932 agrees in confirming the earlier layout. In trying to buttress his testimony, it seemed to the Court that Mr. Schofield in reality weakened it by his claim that the northerly line of the locus was in reality to the north of where he had placed it on his filed plan. He testified that if a line ran from point O in the swamp, shown on the sketch plan, to N and then continued in the same course, it would pass close to point S and reach the westerly line at a point somewhere between points H and I, illustrated on the sketch plan. He stated that he placed the northerly line where he did because Mr. Snow indicated that he wanted to be sure not to claim other land about which there might be controversy. In other words, Mr. Schofield placed the line where he did on instructions from Mr. Snow, but believes that it should be placed farther to the north. This claim of Schofield would then tend to bear out the 1848 plan shown as Exhibit 27. If Schofield were right in his assumption, the distance claimed by petitioner measured along the westerly line of Old County Road would be the 722.32 feet now claimed, plus 147 feet (9 rods), or a total distance of 869.32 feet. The distance on the westerly line of land conveyed to Galdston by the deed from Perry, Exhibit 2, was 601 feet; if Schofield were correct this distance would measure some 715 feet, a far cry from the 601 feet called for. The Court also suggests that even though the layout of 1867 shows Grove's land being bordered on Brown's land, it would still be possible for Grove to own a small parcel bordering Old County Road and the School House Lot, according to the plan as drawn by Nickerson. It may well be that Mr. Schofield is partially right for even if the Brown parcel was located on a line drawn from O through N to the line H-I on the sketch plan, it would be bounded to the south by land of John Mayo, Senior in the 1860's. This land to the south was undoubtedly conveyed to the Town of Truro, at least in part, by an unrecorded deed as is evidenced by the Hamilton deed (Exhibit 21). It certainly was not included in the land Mayo conveyed to Grove (Exhibit 15) which expressly bounds Grove's land to the northeast by the "School House Lot". Petitioner Galdston's record title depends upon this deed, Exhibit 15, and then the Perry deed, Exhibit 2, above all others. Dr. Galdston testified that he believed he owned the driveway to the north of the claimed line. There was evidence that "Pop" Snow had told Chamberlain that Galdston so claimed but that he, Snow, knew he did not own this portion of land. Dr. Galdston testified he was upset when the filed plan did not illustrate his ownership of the driveway and made his feelings known to his attorney. There was testimony that the Chamberlains called on Murray Frank and his wife, Margaret G. Frank, formerly Margaret Galdston, in residence at the Galdston home in September, 1966, showed them the Nickerson plan and reported their purchase of the parcel marked "Roman Catholic Bishop of Fall River" from the Bishop. The Chamberlains claimed to own the land north of the southerly line shown on the Nickerson plan and marked line J-K-D on the sketch. As a result of this conference, an offer was hand drawn and signed by the Franks, offering to buy a piece of land bounded on the east by Old County Road, 258'; on the west by land of Galdston and Levy, 140'; on the south by Galdston, 339'; and on the north by the travelled way into Galdston land and generally shown as D-G-I-J on the sketch plan. A purchase price of $10,000 was agreed to an a $200 deposit was made. The hand drawn agreement was dated September 3, 1966 and signed by Margaret G. and Murray W. Frank and the Chamberlains. When Dr. Galdston heard of this he claimed he already owned the land and although it is not clear from the evidence for what reason the sale was never consummated and the money was returned. The Court therefore concludes that this aborted real estate transaction is, at the very least, evidence of the Franks' uncertainty as to Dr. Galdston's ownership of this particular parcel. As can be seen from all above, the Court is not persuaded that the northerly boundary of the locus is as set by Mr. Schofield from point A to D on the sketch. Nor is the Court ready to accept the boundary as set by Mr. Nickerson in his plan. Mr. Nickerson's line shows two marked changes of course which changes are not substantiated by descriptions in any of the pertinent instruments. In addition, if the westerly line of the Galdston premises ran from point J south to point C on the sketch plan, the distance would be some 550 feet, a marked difference from either the 38 rods called for in Exhibit 15 or the 601 feet in Exhibit 2. One possible alternative would be to set the northwest point of Exhibit 2 at point X, as shown on the sketch plan. This point X is not shown on the filed plan or the respondent's plan, but is shown as a point marked "Stake" on the filed plan in Land Court Registration Case No. 28240, drawn by Whitney and Bassett - Architects and Engineers Hyannis, Mass. dated November 1957. This stake is 7.92' northeast of a second stake shown on this Whitney and Bassett plan, which second stake coincides with the point marked "C.B. set repl. Stk. fnd." on the filed plan and marked "B" on the sketch plan. From point X to point C on the sketch plan would be a distance of 590.59 plus 7.92 feet or 598.51 feet, very close to the 601 feet called for in Exhibit 2. Certainly this point comes closer to being as described than point A as picked by Mr. Schofield and point J as picked by Mr. Nickerson. The Court, however, believes there is yet a better explanation than above. The westerly line, as described in Exhibit 15, runs some 38 rods southerly to the Proprietors Road. If this distance, which equals 627 feet, is measured north from the spike set in petitioner's plan at the junction of the roads, point C on the sketch, it reaches a point almost exactly on the pole line which runs from the Galdston house to the street. The westerly line as called for in Exhibit 2 should be some 601 feet in length. If 601 feet were measured southerly from the pole line, one would arrive almost exactly at a point marked "Stk. fnd." on the file plan, shown as point Z on the sketch plan, which in turn is located 26.93 feet northerly of the "Spk. Set" at the road junction and marked point C. This suggests at least that point Z might well have been the point of beginning in the Perry to Galdston deed, Exhibit 2. In addition, if point Z were the point of beginning in this deed, Exhibit 2, it would mean that the easterly boundary of the locus measured along the westerly side of Old County Road would be shorter than as measured on the filed plan. Exhibit 2 calls for an easterly boundary, line C-D on the sketch plan, of 682 feet. The filed plan sets the distance as being 722.32 feet. To place this southerly point as point Z would result in a decrease of this distance by some 25 feet, making it 697 feet, much closer to the 682 feet called for in Exhibit 2. The Court finds that the northwesterly point of Exhibit 2 and of Exhibit 15 is located at the point marked "Y" on the sketch plan, directly on the pole line from the Galdston house easterly to the street where this line is intersected by the westerly line as shown on the filed plan projected northeasterly in its same course. This northwesterly point will be approximately 37 feet northerly of point B on the sketch plan and approximately 627 feet northerly from point C. It is likewise approximately 601 feet northerly from point Z on the sketch plan. In locating this point, the Court finds that the northerly line of petitioner's locus runs westerly from point D to point Y, a distance of approximately 324 feet. The petitioner introduced certain evidence of adverse use of the locus through various members of the Galdston family, which evidence included picking beach plums and berries, planting gardens, maintenance of a pony shed and use of the land for a pony cart, rifle practice, tenting by the Galdston children, burying garbage and refuse on the land and other uses ranging over a period of time from the original purchase by Dr. Galdston in 1932 to the present. The area so used was not fenced or otherwise confined to an ascertainable limit but the use became less as one proceeds farther from the Galdston house. The Court finds that this use was made of this land by petitioner and by others, but there is insufficient evidence that such use was of an exclusive nature. The petitioner did use the pole line picked as the boundary and did this notoriously, obviously claiming it to be his. However, in view of the finding made by the Court, this area is found to be encompassed within the northerly line of petitioner's record title. The use to the north of this line D to Y on the sketch plan is found by the Court to be sporadic, non-exclusive and insufficient to support a claim of title under the doctrine of adverse possession. Even if the Court were to find that the petitioner does not hold sufficient record title proper for registration to the area southerly of the D-Y line, petitioner's evidence of his use of this area is such that the Court would agree with his claim of title under the doctrine of adverse possession. Petitioner's request for rulings Nos. 3 and 7 is granted while his request for rulings Nos. 1, 2, 4, 5, 6, 8, 9, 10 and 11 is denied. The Court rules that petitioner has title proper for registration to that portion of the premises described in the petition and shown on the sketch plan attached that lies southwesterly of the line D to Y on the sketch plan and to that part of the premises that lies northwest of the line I to B on the sketch plan, subject to the stipulations filed in this case between petitioner and Sabina G. Teichman et al and between petitioner and Robert S. Levy et al. The Court orders that that part of the petition describing land to the northeast of the line D to Y on the sketch plan be severed and dismissed and that the title to the remainder of the land described in said petition to be registered and confirmed, subject to rights of way as set forth in the stipulation between petitioner and Sabina G. Teichman et al and the stipulations between petitioner and Robert S. Levy et al. [Note 1] In an attempt to maintain a consistency between certain old deeds admitted into evidence and descriptions used in this decision, the Court will hereinafter refer to the boundaries of the disputed portion of the locus as shown on the sketch plan in the following manner: Line A-C is the westerly boundary, line C-D is the easterly boundary and line A-D (and other lines almost parallel thereto) is the northerly boundary. [Note 2] See Sheet 61 of Abstract in Land Court Registration Case No. 28240, which registered land to the northwest of the locus and of which this Court now takes judicial notice.